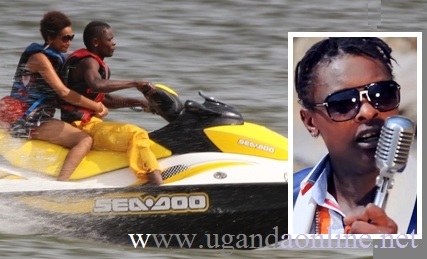 The Badilisha star Jose Chameleone was over the weekend spotted with his wife Daniella at Spenah Beach in Entebbe cruising on a jet ski. The lovers looked like newly weds on a honeyman as Daniella clung on to Chameleone as he raced away. The couple has of late been in court for various issues. Chameleone was cleared in the Karamagi saga and there was no better way of celebrating that milestone other than shooting his Badilisha video which happens to be his latest Album. Daniella on the other hand will be in court again on the 28-Feb-2013. Insider sources have it that Daniella is in talks with Kasuku lawyers to have the case settled out of court. Regarding Chameleone's latest Album launch, this is what he has to say: "We have never been this ready! 26th April 2013 #BADILISHA live.. the Grounds are Waiting,the drums are roaring and all shall sing along the sounds of LEONE ISLAND,the #Badilisha Dance shall be Synonymous with all and even the sick and eldery shall disaprove their sympathisers ..#BADILISHA LIVE...2013, these are not promises,these are guarantees for a great nite on 26th April... when we officially usher in the muscial year."